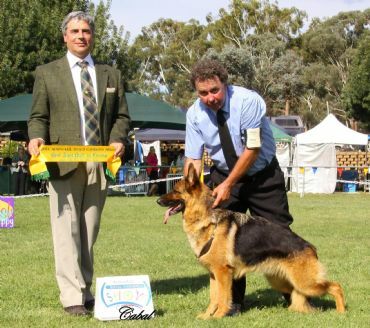 'Elle', shown very sparingly, is a Multi In Show & In Group winner including winning BEST EXHIBIT IN SHOW at the Canberra Non Sporting, Utility & Working Dog Club show at the tender age of 13 months handled beautifully by T Bailey. She has a great temperament & is a delight to live with. 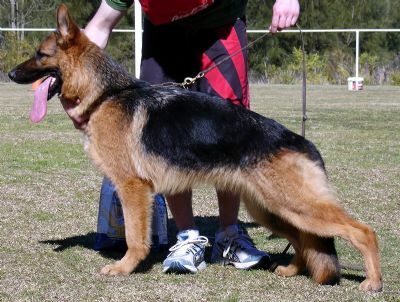 "Elle" obtains her Australian Championship title at the age of 18 & 1/2 months winning Best Exhibit In Group at Yass & then Best In Group & Intermediate In Show at Blacktown K & TC on the same weekend. Both shows had some extremely stiff competition. Elle's critiques from Mrs E Oster (Israel)at the ACT GSD show held 29.9.07 reads " Aged 1 year 1 month. Excellent type & expression, medium size, medium strong, excellent head with good expression, very feminine. Very good angulations, correct top & underlines. Croup could be a bit longer. Stands correct in front. Correct coming & going. Excellent mover with a lot of drive & power. Graded Very Good.